^ Kent – A to Z street Atlas. 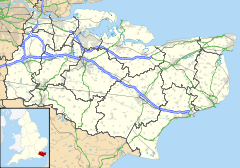 Map of the Whitstable area (Geographers A-Z Map Company Ltd). : 226. ISBN 9781843487555. Chisholm, Hugh (编). Whitstable. 大英百科全書 第十一版. 劍橋大學出版社. 1911年. This page is based on the Wikipedia article 惠斯塔布; it is used under the Creative Commons Attribution-ShareAlike 3.0 Unported License (CC-BY-SA). You may redistribute it, verbatim or modified, providing that you comply with the terms of the CC-BY-SA.